Dr. David Gushee has been for many years the leading conservative Christian ethicist, a friend to Evangelicals, with some twenty books to his name and another releasing next year. But now he’s gone and done it, announcing recently that he has switched his view of gay covenantal (marriage) relationships. Gushee now says the church should embrace gay marriages as fully as heterosexual marriages, and LGBT Christians as full members of the church. Not surprisingly, that has earned Gushee more than a few friends-turned-enemies. 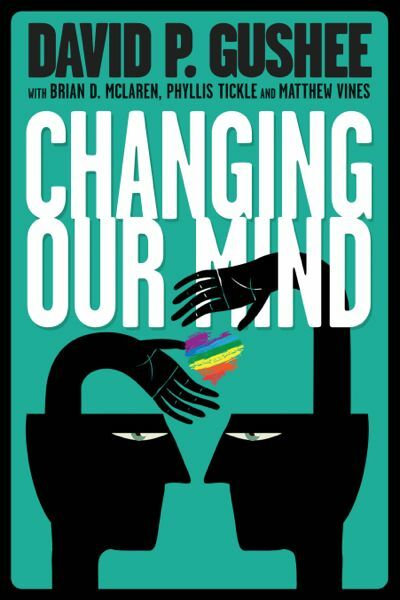 In his latest book, Changing Our Mind, Gushee gives a brief explanation of himself, how his mind changed and why he thinks the church universal needs to do some serious rethinking (and repenting) vis-a-vis the gay issue. I won’t retell his story here; I’ll leave it to you to read the book. But here are a few things I think commend this book to a broad audience. 1) It’s short, only about 125 pages, so anybody can get through it. 2) The style is accessible, not academic as with many of his other works. It reads more like a journal than a scholarly tome, so you won’t be wondering what in the heck he’s talking about. 3) Gushee is a sage among straight, conservative Christians, so he can’t be easily dismissed. Some Evangelicals have objected to similar works by gay Christian authors such as Justin Lee and Matthew Vines because, well, the authors are gay and, therefore, naturally prone to having a gay-affirming position, but also because they’re young and not credentialed. This has always seemed unfair and snobbish to me, but it has been a problem. Gushee is straight, seasoned, and credentialed. He’s tough to ignore. 4) Changing Our Mind offers exhortation to folks on both sides of the debate. Gushee cautions gay-affirming Christians not to charge all those opposed with hate or fear. Many traditionalists are motivated simply by a desire to be faithful to the biblical texts, which they read as critical of gay relationships. Disdain and homophobia are far from their minds. But Gushee also admonishes his critics for, at times, behaving more like Pharisees than the Savior, seeking to enforce rules without any concern for how those rules affect real people. 5) The whole book just feels balanced. Gushee writes, “If what we are talking about is blessing an anything-goes ethic in a morally libertine culture, I stand utterly opposed, as I have throughout my career. But if what we are talking about is carving out space for serious committed Christians who happen to be gay or lesbian, to participate in society as equals, in church as kin, and in the blessings and demands of covenant on the same terms as everyone else, I now think that has nothing to do with cultural, ecclesial and moral decline, and everything to do with treating people the way Christ did” (p. 117). 6) Gushee is humble. He repents, and when he does, you sense his grief. He makes a point of “apologizing to those who have been hurt by my prior teaching and writing on the LGBT issue. Where I have the chance to amend my written work I will do so. I ask your forgiveness. I apologize that it has taken me so long to get here. I look forward to continuing the journey together in your company, if you will have me” (p. 126). Click here to read a transcript of a recent speech Gushee delivered at a conference of The Reformation Project in Washington, DC.